Dr. Sharpe received her A.B. from Harvard University, where she did undergraduate thesis research in the laboratory of Dr. Jack Strominger. She received her M.D. and Ph.D. degrees from Harvard Medical School where she did PhD thesis research on reovirus pathogenesis in the laboratory of Dr. Bernard Fields. She completed residency training in Pathology at Brigham and Women’s Hospital and postdoctoral research in the laboratory of Dr. Rudolf Jaenisch at the Whitehead Institute. 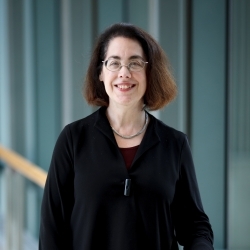 She currently is the George Fabyan Professor of Comparative Pathology, Head of the Division of Immunology, and Interim Co-Chair of the Department of Microbiology and Immunobiology at Harvard Medical School. She is a member of the Department of Pathology at Brigham and Women’s Hospital, an Associate Member at the Broad Institute of MIT and Harvard, and Leader of the Cancer Immunology Program at the Dana-Farber/Harvard Cancer Center. Dr. Sharpe is the Co-Director of the Evergrande Center for Immunologic Diseases at Harvard Medical School and Brigham and Women’s Hospital. She has served as a member and chair of the NIH Hypersensitivity, Autoimmunity and Immune-mediated diseases (HAI) study section and is currently a member of NIAID Council. She is also the President of the American Association of Immunologists. Dr. Sharpe’s functional analysis of costimulatory pathways regulating T cell activation has led to understanding of (1) the roles of B7-1 and B7-2 as positive regulators through CD28 and (2) negative regulators through CTLA-4, and (3) the role of PD-L1 and PD-L2 as negative regulators through PD-1. This functional characterization has provided critical translational insights that underpinned development of immunotherapies for cancer, autoimmune diseases, and transplant rejection. Dr. Sharpe’s laboratory currently investigates the roles of T cell costimulatory and coinhibitory pathways in regulating T cell tolerance and effective antimicrobial and antitumor immunity, and translating fundamental understanding of T cell costimulation into new therapies for autoimmune diseases and cancer. Dr. Sharpe has published over 300 papers and was listed by Thomas Reuters as one of the most Highly Cited Researchers (top 1%) in 2014 and 2015 and a 2016 Citation Laureate. She received the William B. Coley Award for Distinguished Research in Tumor immunology in 2014 for her contributions to the discovery of PD-1 pathway. I am truly honored to be a recipient of the Alpert Award. It is especially meaningful to be recognized by my colleagues for discoveries that helped define the biology of the CTLA-4 and PD-1 pathways. The clinical translation of our fundamental understanding of these pathways illustrates the value of basic science research, and I hope this inspires other scientists.